Similarly, the redirect manager saves a lot of time as you don’t have to manually create redirect lists. It also saves you from having to update them every time you unpublish a post or page. No user is thrilled about ending up at a 404 page (even those really creative ones)! There’s a Redirects menu option that enables you to see and make updates to all of your redirected pages. I don’t have to tell you that SEO has changed dramatically over the years. That said, keywords definitely still matter. The focused keyword export option will allow you to download a CSV that provides a straightforward look at your focus keywords and SEO scores. This saves you from keyword deficiencies (as well as over-optimization). All of the keyword research I perform with my team lives within my personal editorial calendar. This includes all of the phrases and topics I want to rank for in Google, Bing and Yahoo. Yoast Premium’s Content Insights displays the five words or phrases that show up the most on page. This ensures each written piece is targeted and optimized by subject. You can control much of the technical aspects of your blog from within the Search Appearance menu option. We immediately configured these settings to match our preferences, but you can get help via support as a Premium user. You can control how categories, tags, author archives, media and other content elements show up in search and seamlessly configure your RSS feed, breadcrumbs from within this section. You can also optimize for Knowledge Graph by adding your personal or company details. By accessing the Tools menu option, you can import settings from existing SEO plugins. You can also export your settings for use on another blog. Additionally, it is easy to make changes to essential files such as your robots.txt and .htaccess. I have also found immense value in the ability to revise meta title and descriptions using the Bulk editor tool. No tool would be complete without the ability to fetch your Google Search Console information. Yoast makes it very easy to add your authorization code and authenticate. One thing we don’t want to do is create content for the sake of creating content. Pageviews are great, but we’re only satisfied if you are getting value out of Intellifluence blog content. This is why we always take readability into account, and so should you. 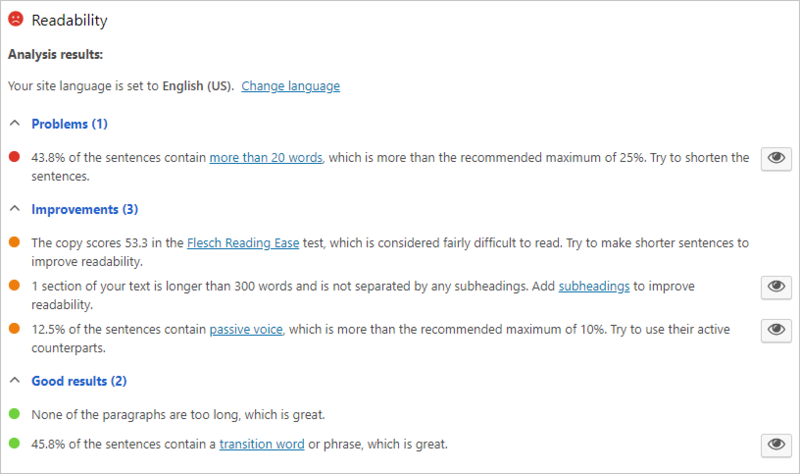 The Readability Check analyzes the content you write and provides a readability calculation based on the Flesch Reading Ease Score. Legendary readability expert Rudolf Flesch developed the score over 70 years ago. This calculation measures word and sentence length to produce a score that demonstrates the complexity of a piece of content. Flesch authored classics such as How to Write, Speak and Think More Effectively and The Art of Plain Talk. While plain talk might not sound too appealing, it’s what most of us crave. A perfect example is the post you are reading now. When I finished my first draft, I was met with a red sad face indicating my readability was poor. The analysis alerted me that 43.8% of my sentences contained more than 20 words (under 25% is ideal). Furthermore, my Flesch Reading Ease score was 53.3 (or fairly difficult). Needless to say, I had some work to do! By clicking the highlight button, writers can see every sentence they need to adjust to optimize the content. While passive voice is sometimes necessary, an active voice generally makes for more compelling content. I’ll keep this in mind for the future! See what i did – er… am doing there? Higher scores indicate content that is easier to read while lower scores suggest a more difficult reading experience. The more we have to think, the more calories we burn so our brains prefer plain, simple communication. After making changes, my score is now over 60% which means you’re conserving calories while reading this review! This post optimized using Yoast guidelines. Clarifying (and simplifying) your message is crucial, so this is an essential feature. Speaking of simple, pricing for the Premium version of Yoast is very simple and straightforward. It’s $89 (plus any applicable taxes) per site, per year. It also comes with Premium updates and 24/7 support. 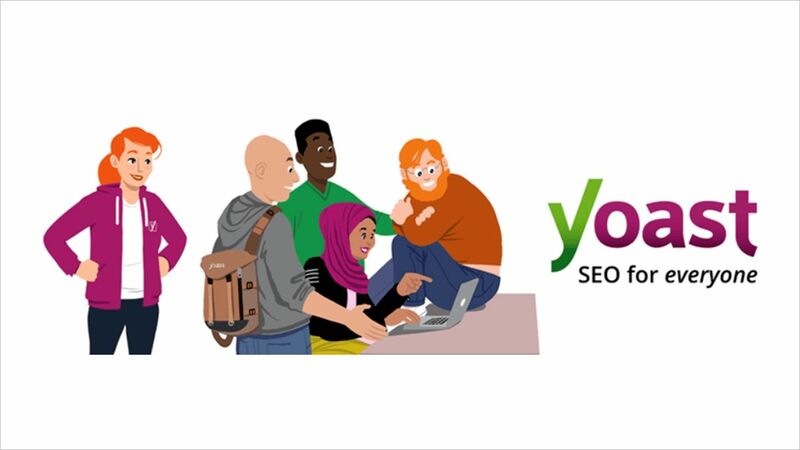 As it is, Yoast updates their plugin every two weeks to stay current with any Google algorithm changes. The search giant typically makes 500-600 minor algorithm changes a year, so you can see why this is crucial. Also, there are no ads. If you’re a minimalist such as myself, you’ll love the simple, ad-free interface. With all these things in mind, I can confidently recommend the Yoast Premium SEO plugin to anyone with a blog. 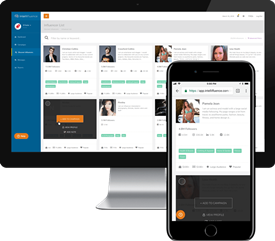 It has helped us create and optimize our content, and I am certain it will help you as well! Editor’s Note: While Intellifluence is one of the largest influencer networks out there, we weren’t actually compensated for this review. It has just made my life a whole lot easier so I wanted to share with you!